Mars, in its most ancient, warmest period, could have lots of water on the surface. Even today you can see traces of ancient rivers, lakes and probably even seas. However, this water got frozen billions of years ago. 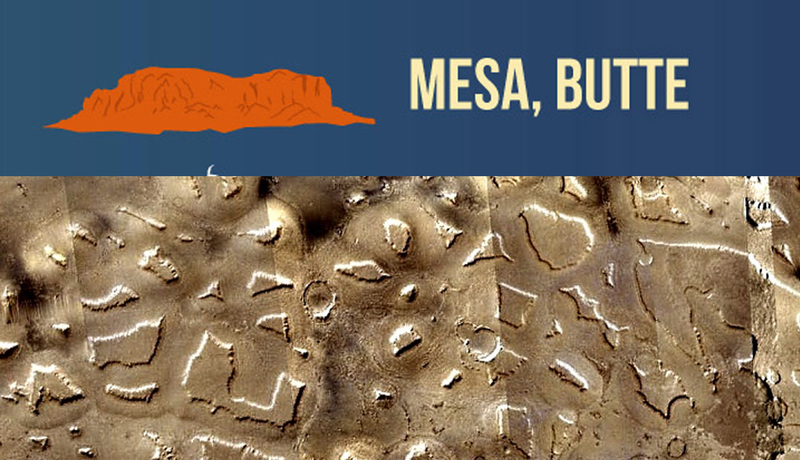 The dry surface has been shaped by winds and frost for the last hundreds of millions of years. Volcanoes, reaching even beyond the upper limit of the dusty atmosphere, are all extinct – or are they perhaps not all dead yet? In some places quite fresh lava flows are visible. So far, neither life nor traces of life have been found on Mars. 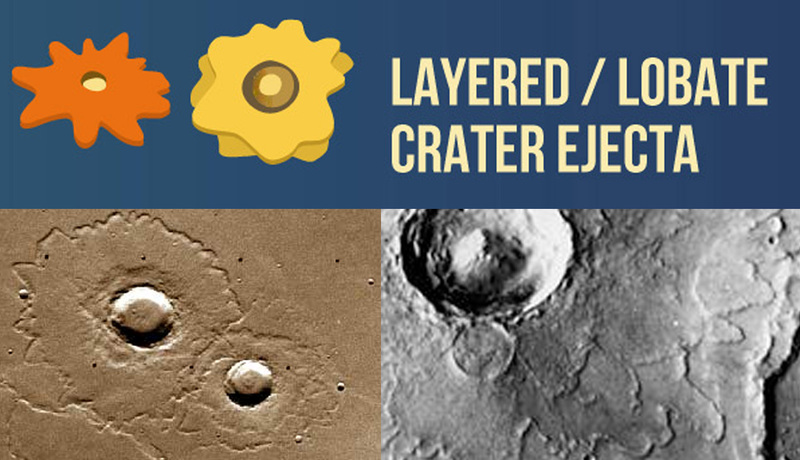 Main area types of Mars are: the southern, densely cratered areas, northern plains, the canyon system of Mariner Valley, two large volcanic rises, two southern basins and the large polar ice caps. What is the size of the surface of Mars? It is about the same size as all of the Earth’s continents. Mars is in the farthest distance from the Sun for a rocky planet. Why is there no ice on its surface? There is ice, but only a little H2O is present on the planet. There is frozen H2O ice beneath the surface in the polar areas and in many valleys and craters it seems as if icy rock debris is moving slowly. What are the youngest formations? The wind blows out new patterns from the dust on the surface of Mars year by year. The seasonal freeze-thaw has set up special shapes on the dust-covered, icy surface: rift- polygons, circular depressions, cairns. On the steep slopes, for example in the canyons and on the walls of craters landslides and gully-like formations are visible. 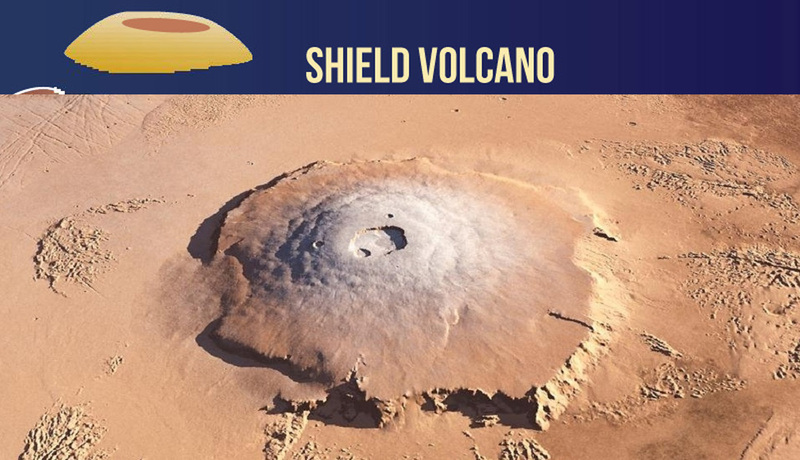 In many places there are small cones (hills), which are of volcanic origin, or maybe were formed by ice or mud. They are too small to be visible on the map. 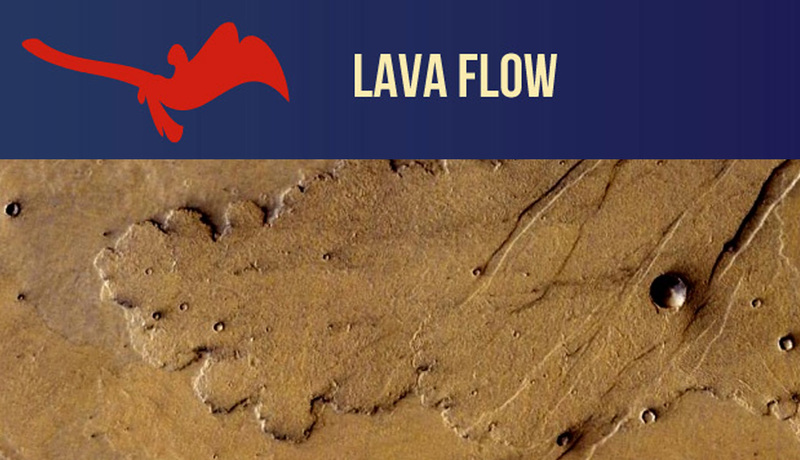 Where do lava flows start from? From the chimneys (vents) of volcanoes or deep crevices. 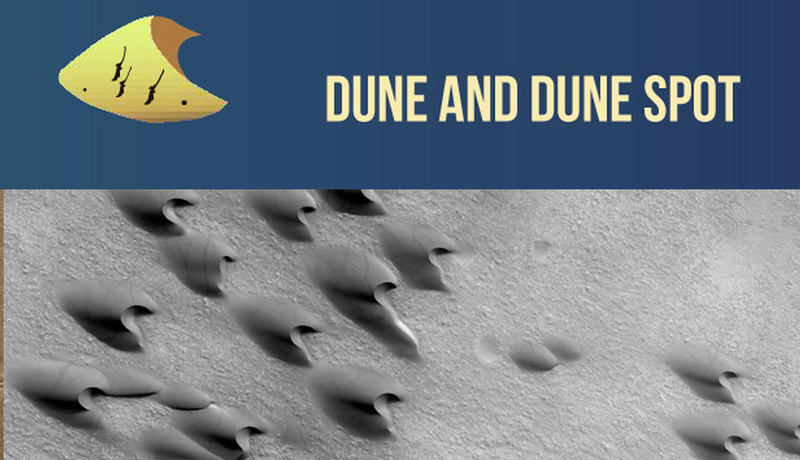 What made the dunes spotted? The material of the dunes is dark, volcanic sand, which is covered in winter by white frost. 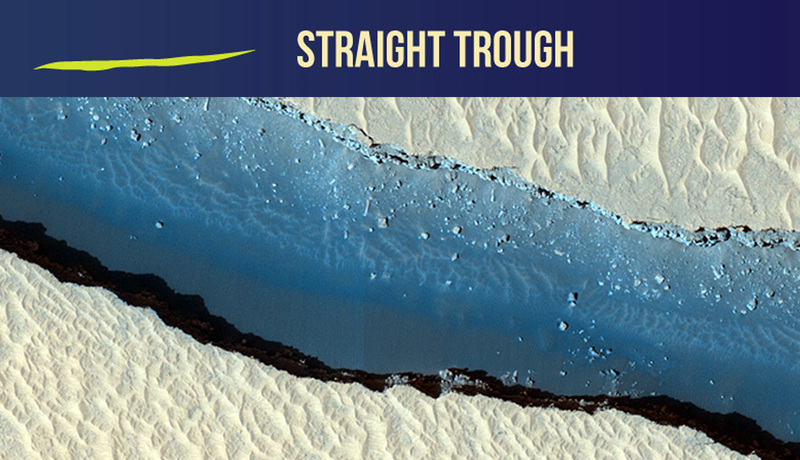 In spring, the frost cover evaporates and dark dune material gradually emerges from under it. 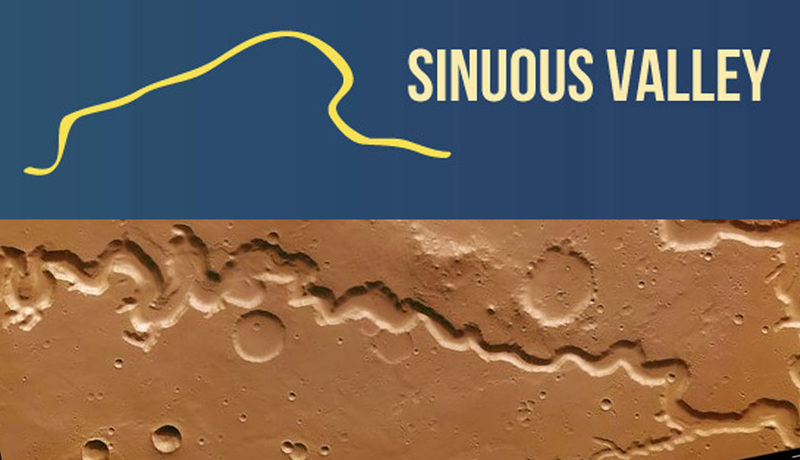 What are the winding valleys? They were probably excavated by running water or spring water. What are the straight trenches? 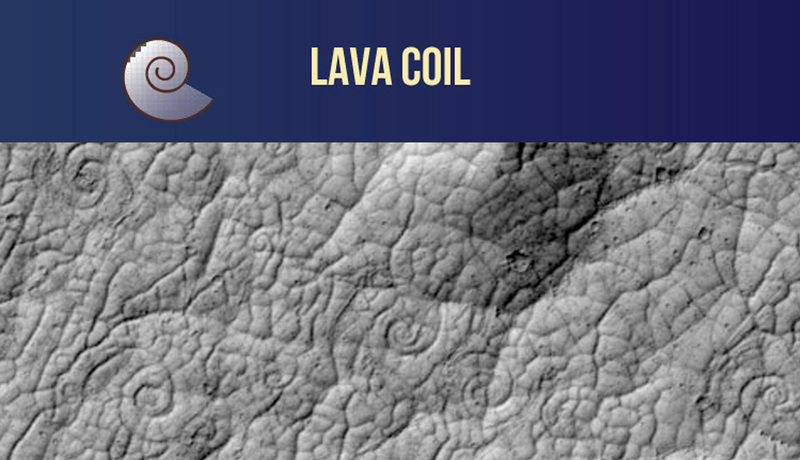 They are cracks in the crust from which lava may erupt, or which was broken by movement along faults (such as would cause an earthquake here on Earth). 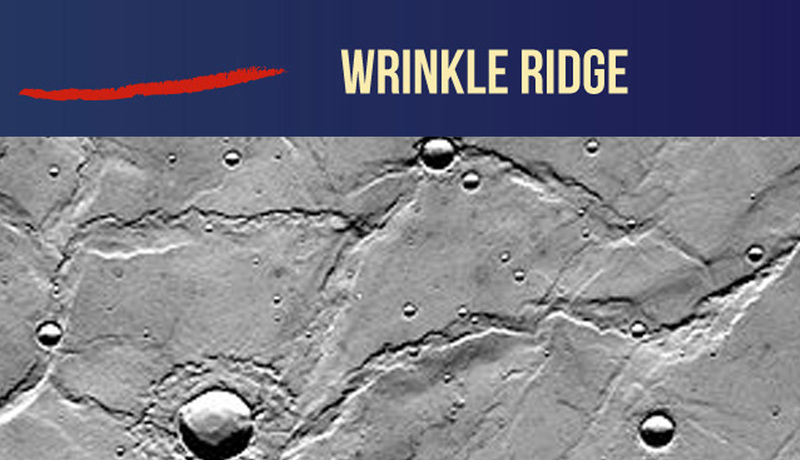 What are wrinkle ridge systems? They are ridges on the surface, caused by forces that push the crust materials together, often found in association with volcanic flows. 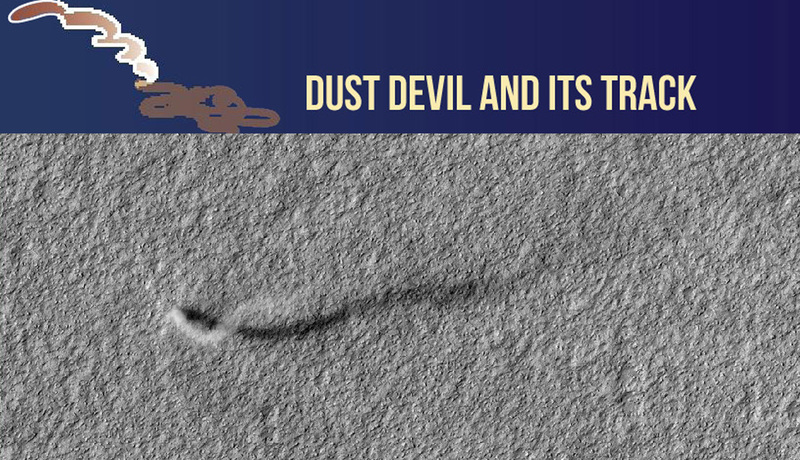 What is a dust devil? It is a minor tornado, which, as passes over the surface, cleans light dust off the surface. What are flower-shaped signs? 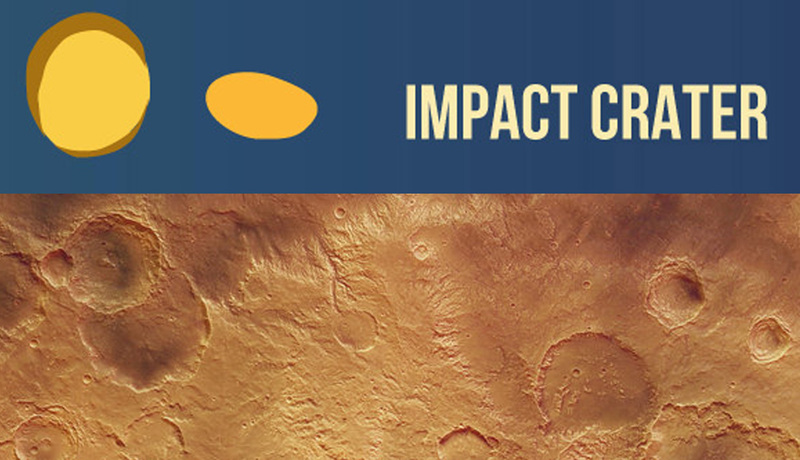 Impact craters with ejecta blanket. Here, the debris ejecting from inside the crater may have contained water and dropped back on the surface as mud. Why is Mars red? The red surfaces are covered by fine-grained dust, deposited from the air; this dust is basically ‘rusted’ so that any iron in the small particles has turned red. Dark surfaces are covered with fresh basalt sand, which is still red but not as bright as the dusty areas. The bright areas are covered with fog or frost (in winter only), the white surface in the polar regions is material of the permanent ice cap. Is there air on Mars? Mars has atmosphere, however, it is very thin compared to the atmosphere of Earth, but that is why wind blows, sand grains polish the surface, sometimes desert dust storms are raging. Rarely, clouds of dust or condensed water vapor are also formed. What are the black things in some craters? Dunes formed from sand trapped in the crater. Do intelligent beings live on Mars? No sign of any creature or any traces of life forms have been found on Mars so far. Was it Martians who broke down the solar panels of Phoenix probe? The solar panels were still on when the probe last operated, but they were not on after the first winter (we know this fact from satellite images). It is likely that so much frost settled on the solar panels during winter, that they could not hold all of the weight. What are spiders doing in the southern polar regions? Those structures are called spiders, in which a system of channels run away from a central area, appearing similar to a spider’s legs. These features result from de-frosting or the release of some gas or liquid from under the surface. What is an Swiss cheese doing in the southern polar region? Upper layers of the southern pole are shrinking, evaporating, leaving circular depressions in some places; these places are named Swiss cheese terrain. 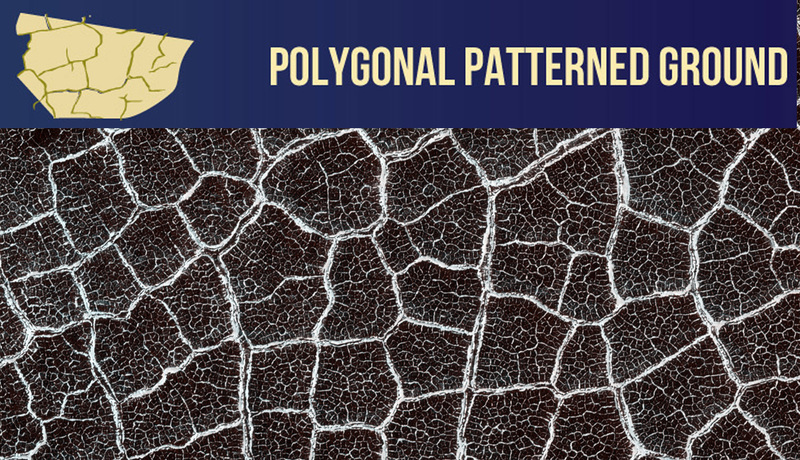 How were the areas with polygon pattern in the northern plains formed? Due to contraction of the surface, likely through a freeze-thaw mechanism. Why are Martians green? About 100 years ago, Martians were imagined so by the writers of fantastic stories, but since then we found out that there are no Martians. Even so, the green colour remain the favourite way to portray possible Martians. 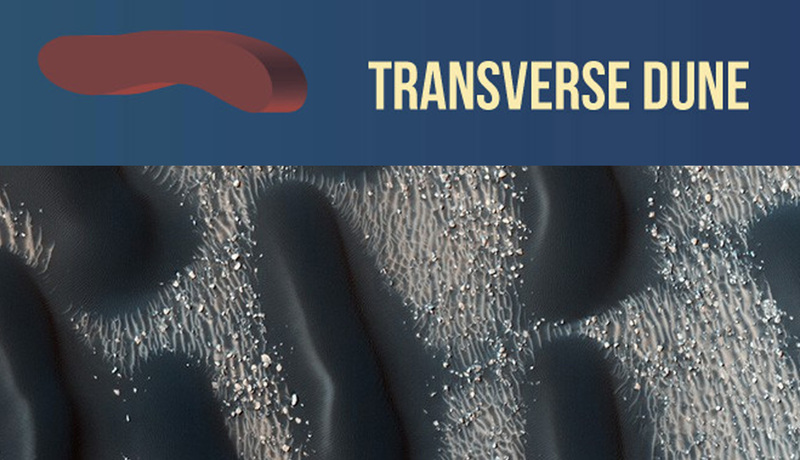 Where does sand and dust on Mars come from? From the fragmentation of rocks. This work can be carried out by wind, fluctuation in temperature, ice, running water, and the created dust and sand can be piled up again and again, or eroded again by the wind during many millions of years. Why is there a white spot on the top and bottom of Mars? They are the polar ice caps. Ice and dust layers are alternating inside of them. The central part never melts in summer; it is cut by spiral valleys. Why are there camels on Mars? These are two-humped camels, which live in the Asian cold deserts. (In the African hot deserts one -humped camels live) to indicate: Mars is cold and dry. We have not seen actual camels on Mars. 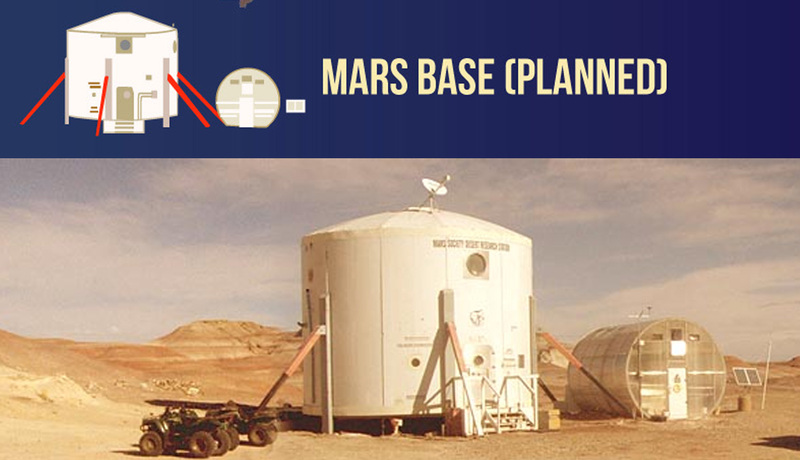 Has any human ever been to Mars? No (at least, not yet). Liquid: salty water may exist in liquid form under special conditions, however, it boils at few degrees C° because of the low air pressure. It stays liquid in shadowed slopes longer where sunlight does not evaporate it. The ground has ground ice that can become liquid if it receives heat. Nomenclature: The main features are named after mythological and biblical places, following the tradition set by Sciaparelli in the 19th century, who created a “mystical and old” world with his names. Large craters are named after scientists, small craters after towns. The Valles Marineris after the Mariner spacecraft. Age: cratered highlands are older than 3.9 Gyr, younger volcanic plains and valley networks are about 3.6-3.8 Gyr old, outflow channels and some gullies are younger, polar ice, dunes and slope lineae are recent. 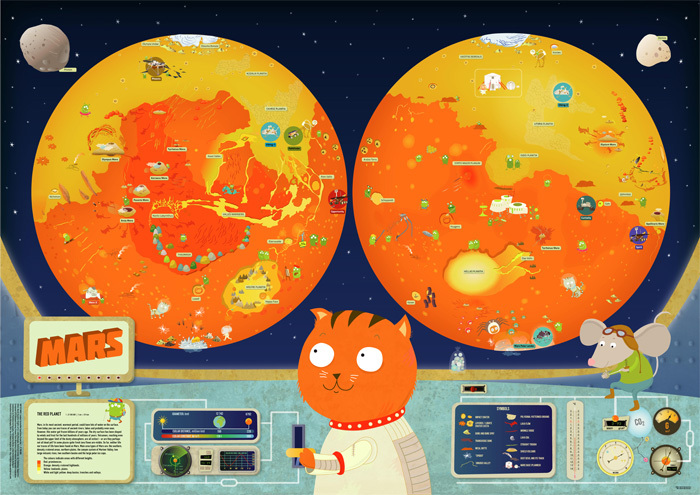 Mars map: (Illustrator: Csilla Kőszeghy) The map of Mars is the most detailed, showing the different landforms together with “little green men,” which interact with the geographic landforms and the landers and rovers in funny micro scenes. 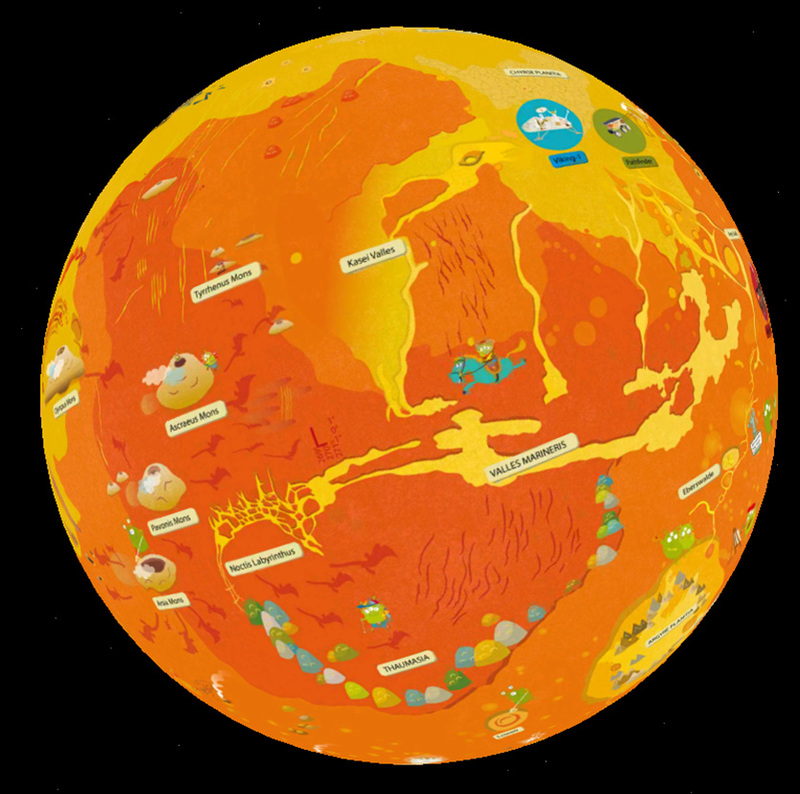 The map highlights the hemispheric dichotomy with yellow-orange contrast: the northern lowlands (yellow) are smooth and mostly craterless, and are covered by lavas or sediments from an ancient ocean, while the southern hemisphere (orange) is very old, is higher than the northern regions, and has lots of impact craters. The Tharsis Rise is more reddish: it is a volcanic rise with several shield volcanoes and recent lava flows. There are two old, large impact basins in the highlands, shown in yellowish-lighter colors. These may have been large lakes in the past. 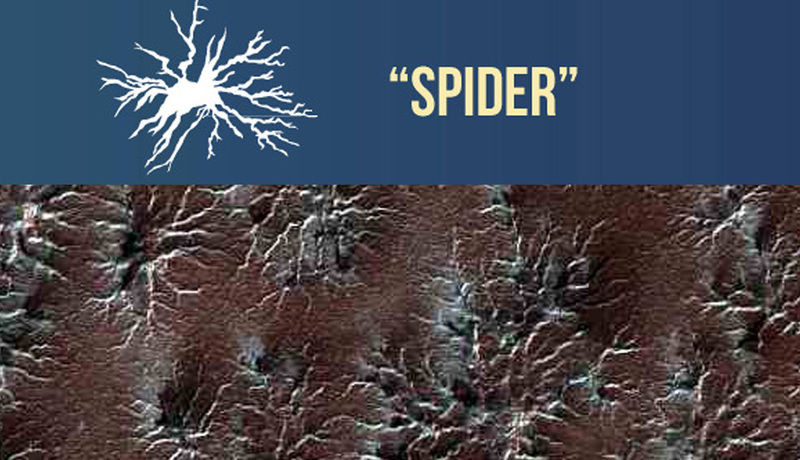 Some Martian features, informally referred to by unusual names, are depicted after their informal names (“Swiss Cheese terrain”, “spiders” etc), which helps to visualize these terms and concepts. The colors refer to different heights but several feature types are shown in perspective-view symbols. Some landforms are emphasized for clarity, such as the Uzboi-Ladon-Margaritifer channel system from Argyre to Chryse.